The first time I saw this strange plant I though the flowers were wilted as they were hanging down. Looking like a poinsettia, is also a plant growen for its colorful bracts. Hello to the genus, Mussaenda. 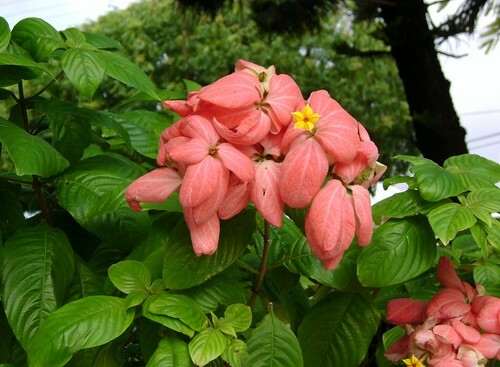 A tropical shrub with colorful bracts that come in pink, white and also a double red. 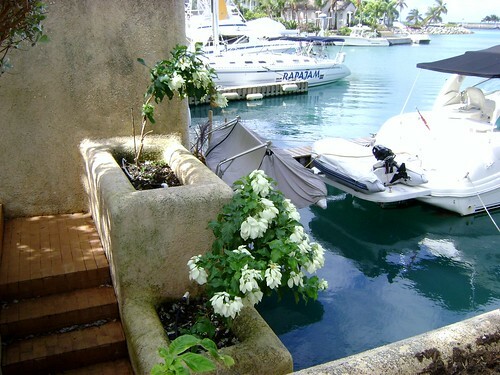 We have both the pink and white planted at my complex in Barbados. 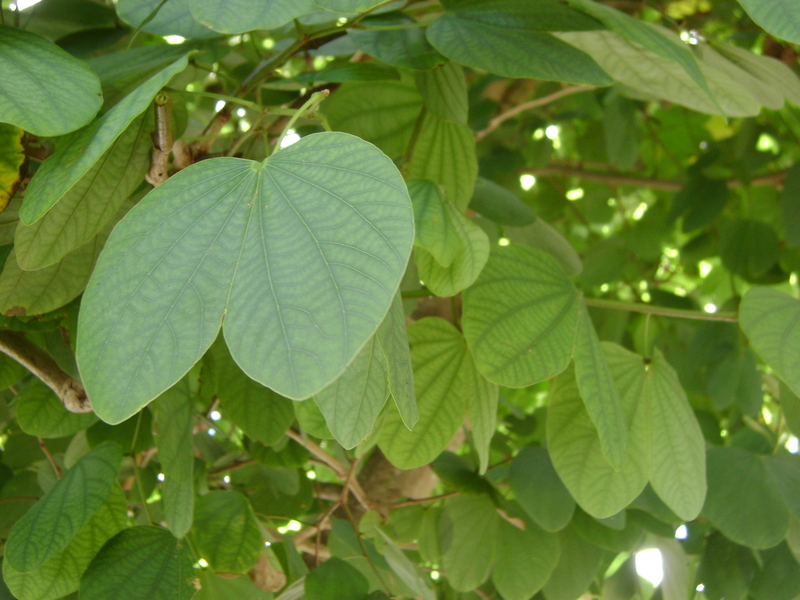 Its common name can be Tropical Dogwood, or Buddah’s Lamp. 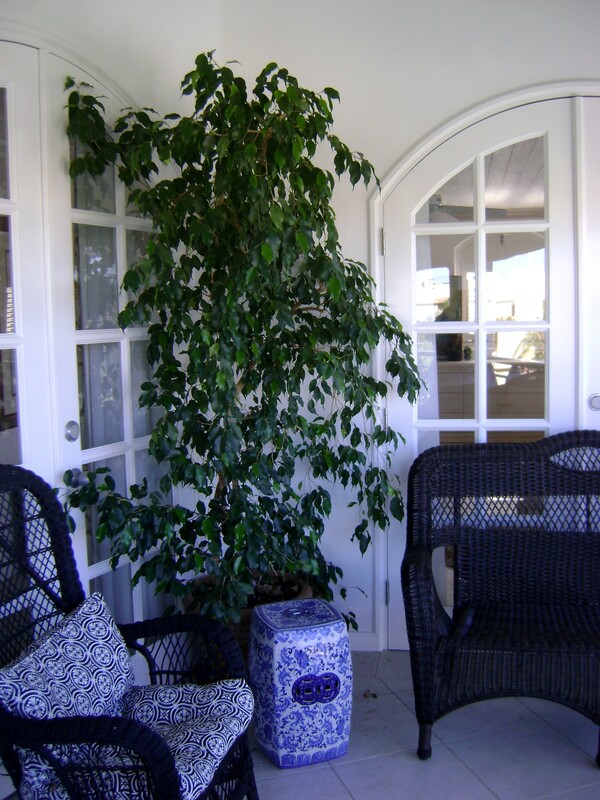 and it makes a terrific tub plant for areas with hot and humid summer weather like Ontario. 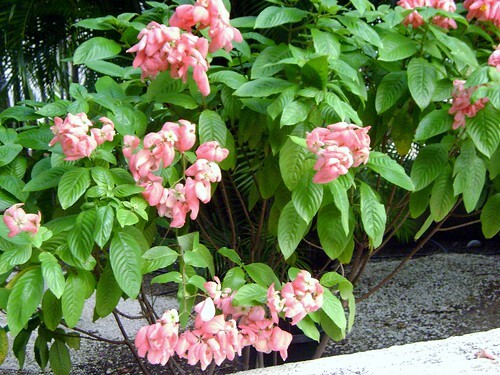 It can be used as a substitute for Poinsettia, as the genus Mussaenda is more disease resistant and less likely to have insect pests. Perhaps another one to bring back to Kilbourne Grove as a little reminder of my time in the tropics. Not that I really have two gardens, although I do have a terrace, and a balcony, and lots of pots, that counts as a garden, doesn’t it? 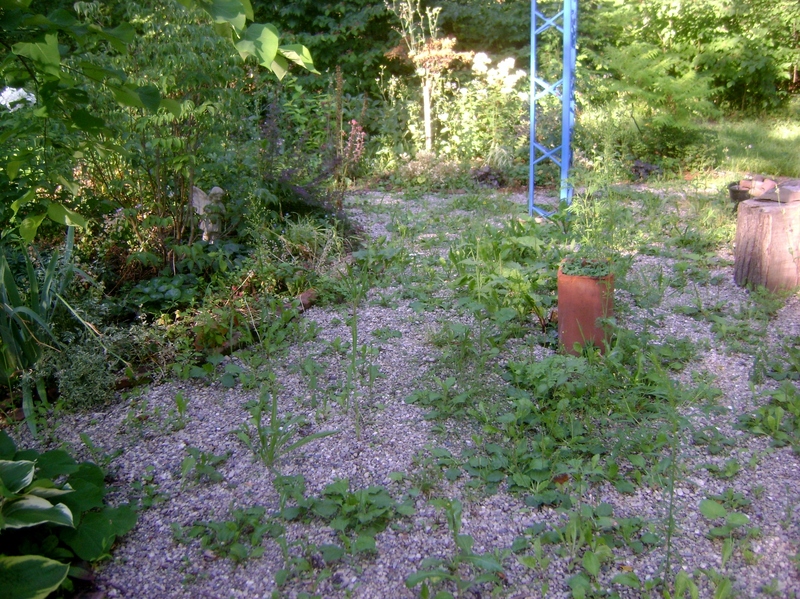 And I am certainly in two countries, and do not have any help in the garden, (except the lawn cutting, and I only do that as I know the bylaw officer would be around if I didn’t). 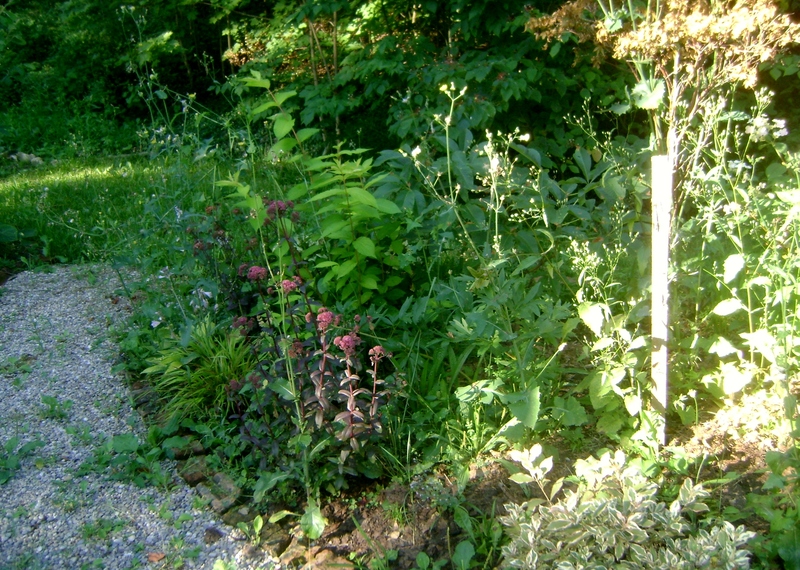 Sometimes I feel stretched very thin, it would be a lot easier if my large garden was where I was most of the year, and my smaller pot garden put up with me for the other 12 weeks, but it is not to be. Now, I have even more pots as I have added a lot of herbs. How about you? Any other two garden gardeners out there? Any gardening in two different countries like me? 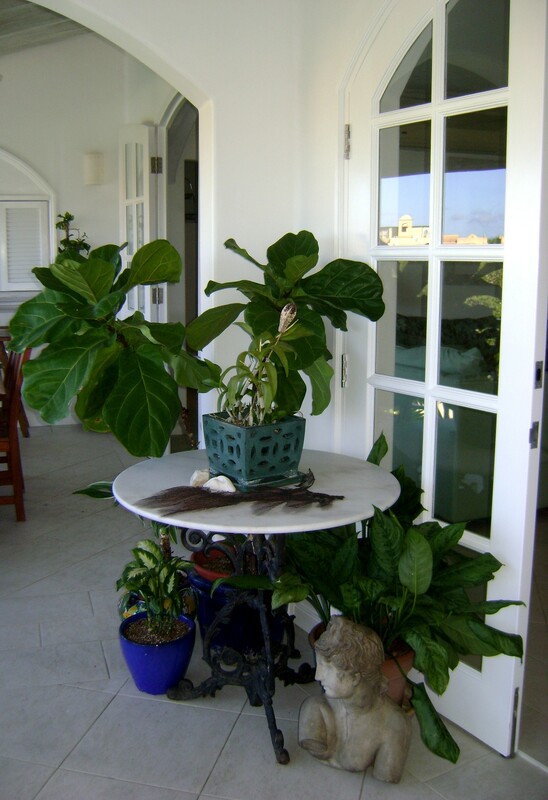 There are so many unusual (to me) plants in Barbados. I have been wondering how I will find out what they all are. 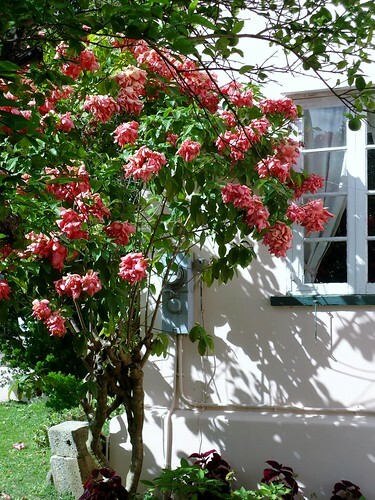 This beautiful flowering tree can be seen from the balcony of the guest room, and I see it every time I wave at Ian as he is leaving for work, hee hee. 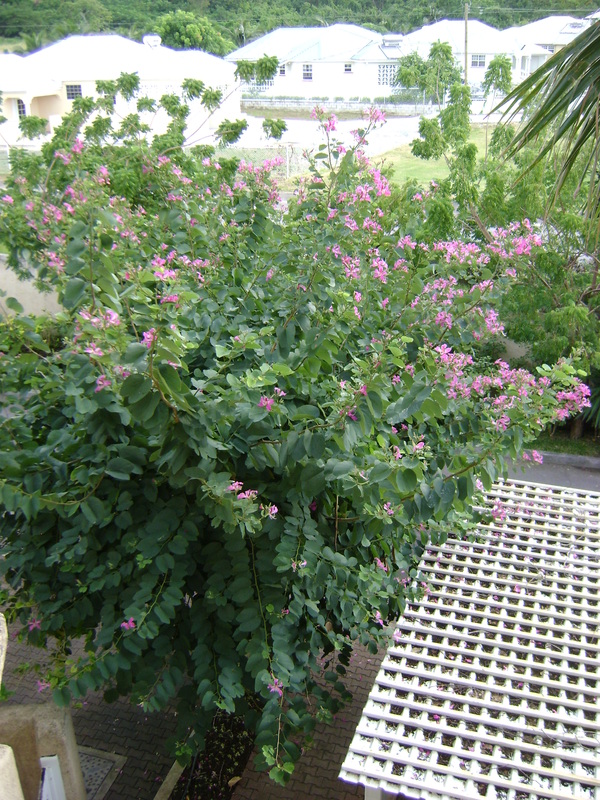 I have been wondering what it is called, it has gorgeous purplish-red flowers, and I love the blue-gray heart shaped leaves. 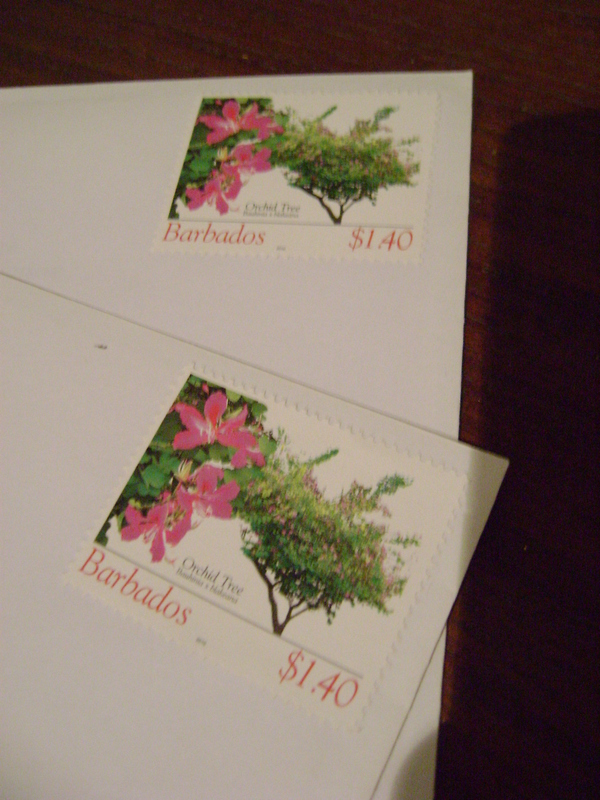 Imagine my surprise when I bought stamps to mail our Christmas cards. At last I had a name. 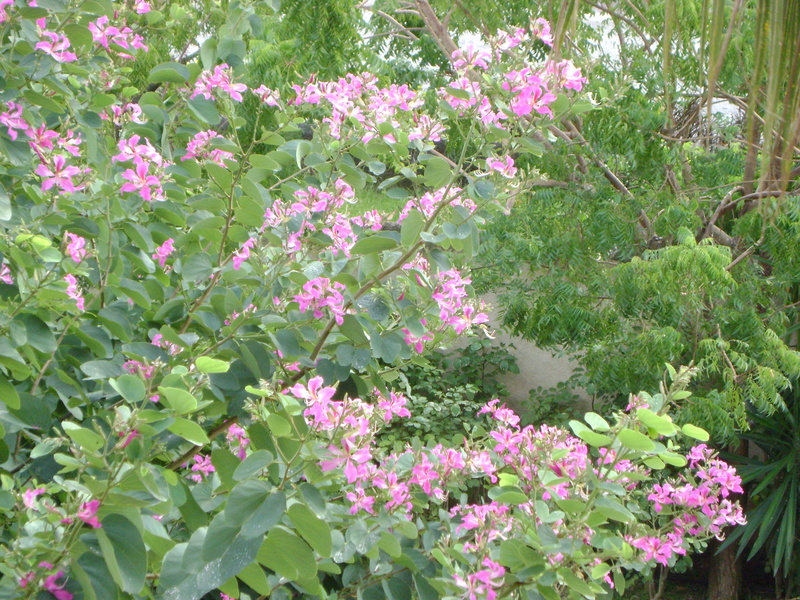 Bauhinia x blakeana is a small flowering hybrid tree that was named for the former governor of Hong Kong, Sir Henry Blake. 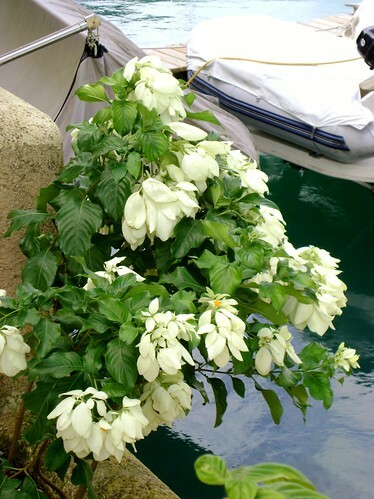 It was discovered there a century ago, and has become the floral emblem of Hong Kong, it is even on the flag. 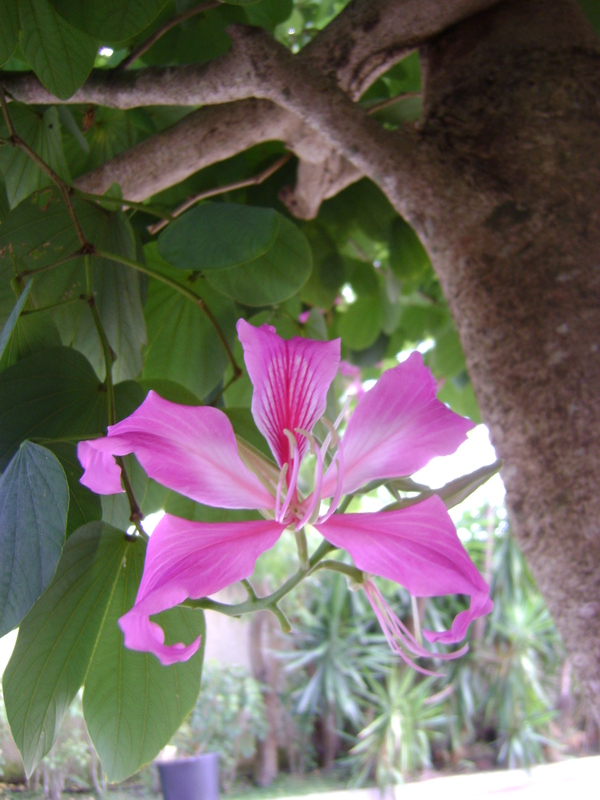 It is commonly known as the Hong Kong orchid tree. 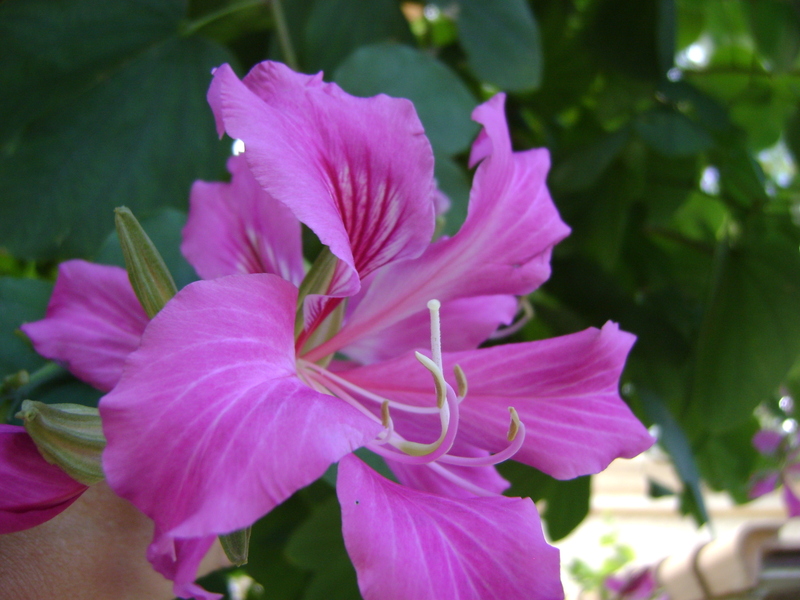 Bauhinia was named for 16th century botanists Johannes and Caspar Bauhin who discovered the species. It is sterile and supposed to be fragrant, although the flowers are too high up for me to find out. At last, one of my mystery plants, identified. Only a few thousand to go.